An upcoming grassroots summit on climate change in Bolivia could mark a pivotal event in the fight against global warming. Bolivian President Evo Morales was a leading voice of dissent at the global climate talks in Copenhagen last year. He accused wealthier countries of shutting out poor nations from negotiations and of offering only token, nonbinding reforms. Poor countries and small island nations deemed the accord a death sentence. As Morales left the Danish capital, he promised to organize a bolder and more democratic initiative to address the climate crisis. 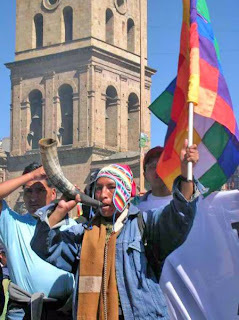 In response, Bolivia is hosting the World People’s Conference on Climate Change and the Rights of Mother Earth from April 19-22 in the city of Cochabamba. Around 15,000 people from across the globe are expected to attend, including some heads of state and delegations from about 100 governments, along with representatives from scientific bodies, nongovernmental organizations and indigenous groups. “Unlike Copenhagen, there will be no secret discussions behind closed doors,” said Pablo Solon, Bolivia’s ambassador to the United Nations. Solon hopes that flexing some global grassroots muscle in Cochabamba will help generate alternative, actionable proposals and political momentum for the next round of climate talks slated for November in Mexico. Working groups destined for Cochabamba have already begun discussions on a series of topics. One of the bolder ideas is the creation of a global climate justice tribunal that could serve as an enforcement mechanism. And conference participants are already working on a “Universal Declaration of Mother Earth Rights” meant to parallel the U.N.’s landmark Universal Declaration of Human Rights of 1948. The grassroots summit will also pay special attention to the links between climate change and increased scarcity of fresh water. Bolivia is home to nearly a quarter of the world’s tropical glaciers. In recent years, these glaciers have lost 40 percent of their mass, leading to growing strains on local water supplies. On April 10, the White House retaliated against Bolivia — the poorest country in South America — by suspending millions of dollars in climate aid, the Bolivian government said. It’s shameful that the smallest, poorest and least powerful of the world are the ones leading the fight for a sustainable global future. If the tide begins to turn, we’ll have them to thank. And if it doesn’t, the globe will be swamped — thanks to us. Teo Ballve is a freelance journalist and editor specializing in Latin American affairs. He can be reached at pmproj@progressive.org. Please be complete in your reporting on this. Bolivia holds almost half the worlds lithium deposites (New York Times 02/03/2009). I'm sure Bolivian President Evo Morales has more on his mind than the green environment. His green wallet in the lithium battery windfall that will come from green technology is what he is really looking at.